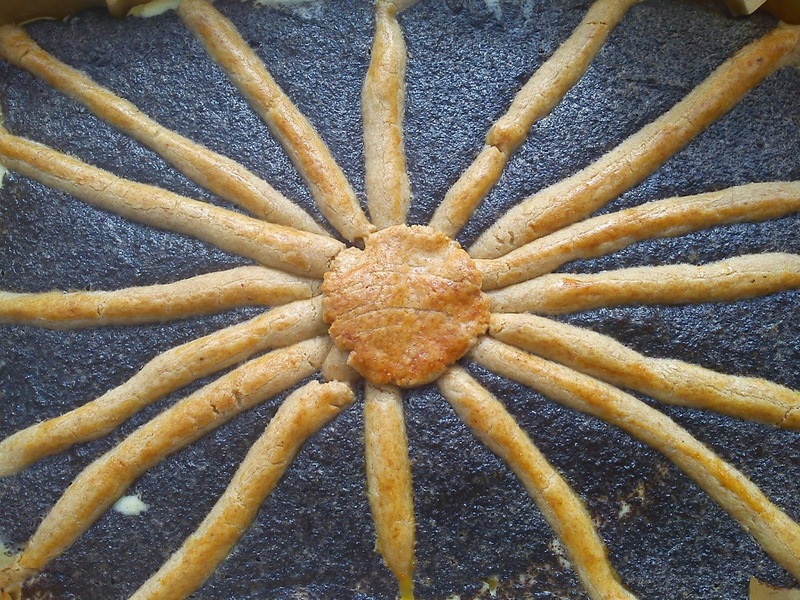 In Germany it is very usual to use poppy seeds in cakes and sometimes as well in yogurt !!! Strange, but actually very tasteful. 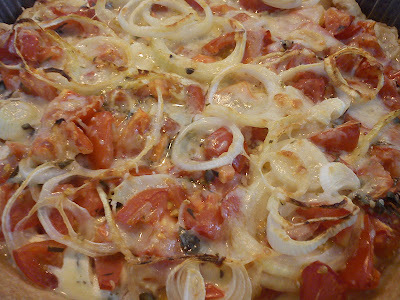 Sp when I recently was in Germany I decided to make some poppy seeds preparation for use in poppy seeds cake together with another very typical German cake ingredients in form of quark/fromage frais. The poppy seeds preparation was sold as an Dr. Oetker ingredients, so you can easily imaging, how many of the other ingredients were Dr. Oetker ingredients as well !!! I decided to use these ingredients as well, as I had no clue, what to use instead of. Heat the (conventional) cake up to 180'C. Mix all the cake layer ingredients together in mixer, until the layer comes together like a dough. Divide the cake layer into 2/3 and 1/3. The bigger portion (2/3) should be rolled into a thin layer, which is used to cover a bigger baking tray as bottom layer. Mix all the quark layer ingredients together to a homogeneous layer in a mixer. Pour the quark filling on top of the cake layer. Mix the poppy seeds filling together on a mixer. Gentle spread the poppy seeds filling as a thin layer on top of the quark filling. Roll the little portion (1/3) into thin strings, which is used for decoration on top of the cake. Glaze the dough part with the egg-milk glazing. Place the cake in the middle of the oven and bake it at 180'C for 45 minutes. Saying the word "sherry" makes me think of old ladies with purple hair !!! Perhaps you would call me prejudiced to have this image inside my head ? Well I do not have purple and I am not old, but I have started to drink sherry cocktail during this Summer after being introduced to this kind of cocktail by my very good friends in Horsens (which by the way are not old or having purple hair). 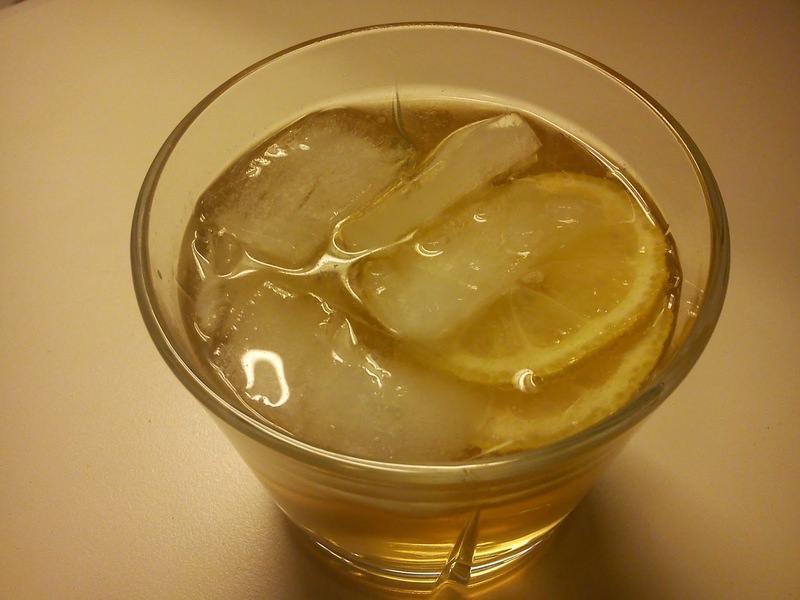 This sherry cocktail is mixed of half sherry and half ginger ale served together with a slice of lemon and ice cubes. Put the lemon slices and ice cubes into a cocktail glass. Fill half the glass with sherry. Fill the remaining glass with ginger ale. When I am travelling either on business or vacation, I like to bring back souvenirs for use in my kitchen either as funny kitchen equipment or food & tea for use in my little kitchen. 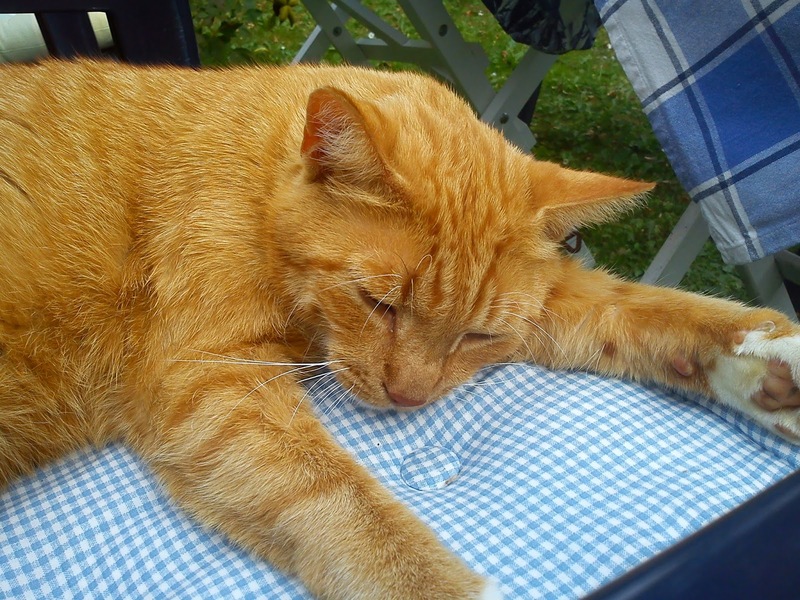 Sometime this Summer I was on one of my regular day trips to Flensburg in Germany with shopping as the main purpose, where it is possible to save quiet some money compared to the similar stuff here in Denmark such as shoes, stockings, sport cloths, food, cat food, body shampoo and body lotion etc. 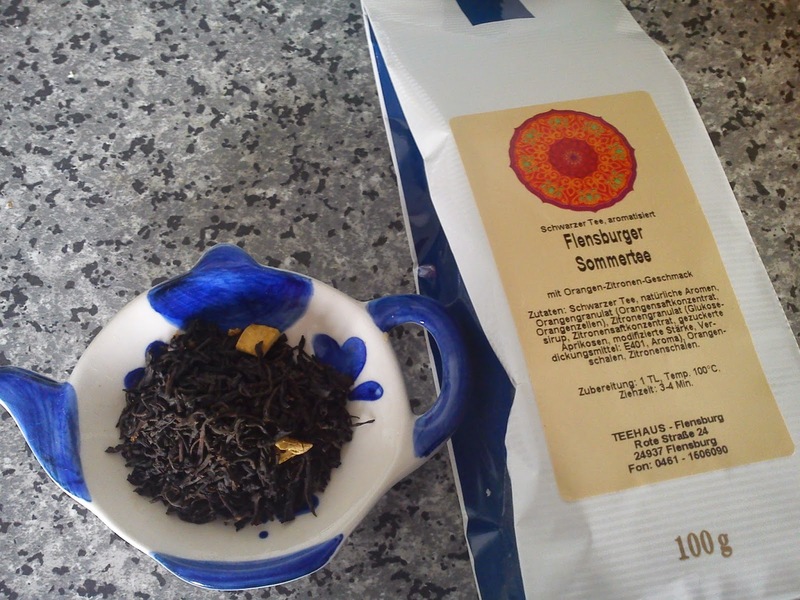 In Rote Strasse (an amazing authentic little street located next to the main shopping area of Flensburg) I have located a little tea shop, where I among three bags of tea brought this Flensburger Summer tea, which is a black tea with orange granulate, lemon granulate, flavour, orange and lemon peel. The smell of the tea is quiet pleasant and refreshing without being perfumed, however, I could with some more taste of citrus in the finally brewed tea. 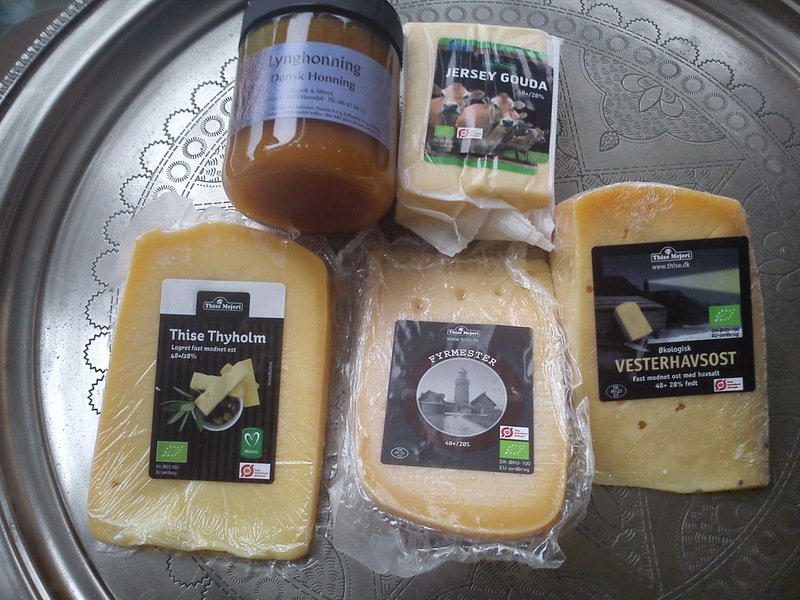 Four different cheeses from Thise Mejeri. This dairy is not located on Fur, but is situated nearby to the island, so we passed this dairy on he way back. So we decided to stop by and taste all the various cheeses, and where endless reams of cheese. 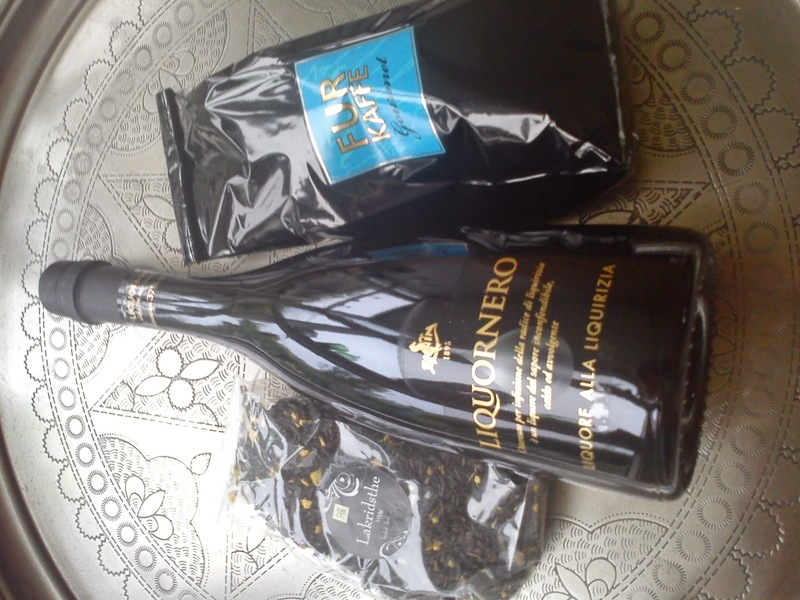 Also a glass of heather honey was a part of the shopping. 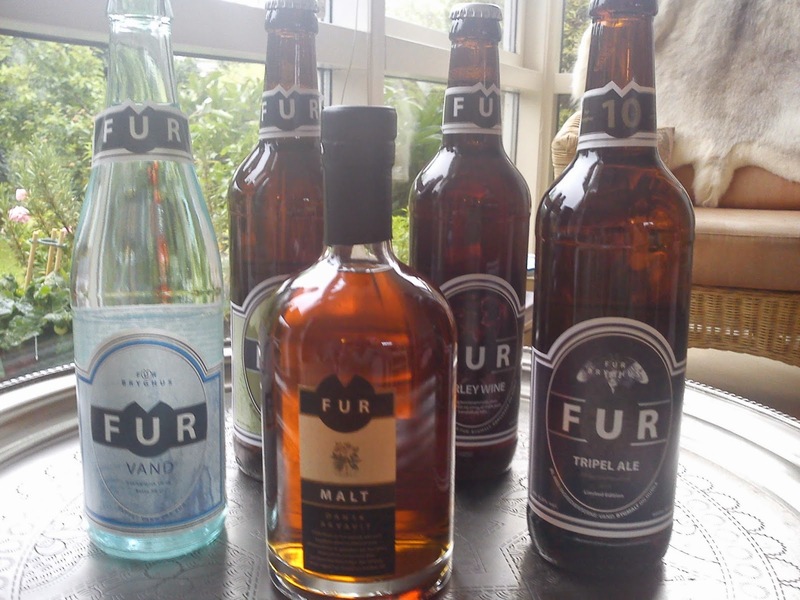 I am not a beer drinker, but it does not mean, that I can not serve beer for my guests, so off cause various beers and some beer aqua vita from Fur Bryghus found a place in my shopping basket. 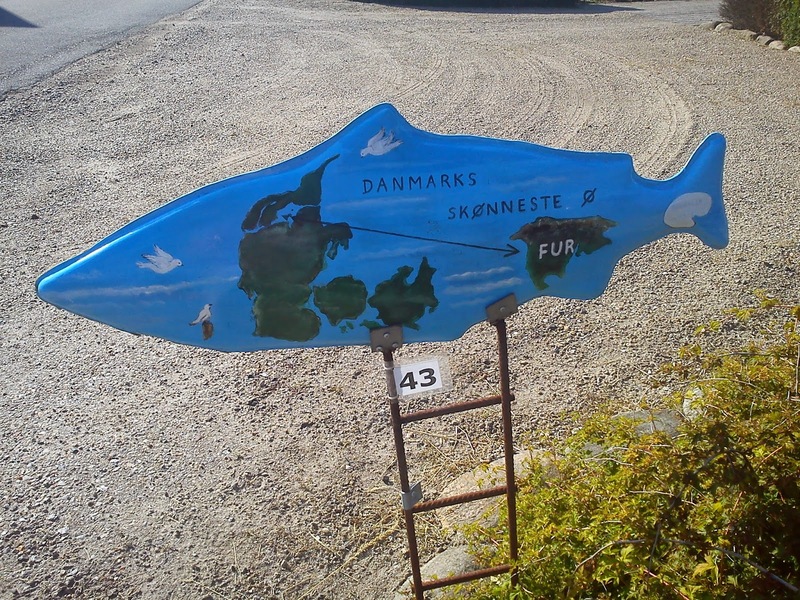 On our bicycle tour around the island of Fur we passed by a small coffee shop called Fur kaffe og the, where the by passers are served free coffee or tea together with a small glass of liqueur or rum !!! Great concept, and yes we returned the favour by buying tea, coffee and a bottle of liquorice liqueur. 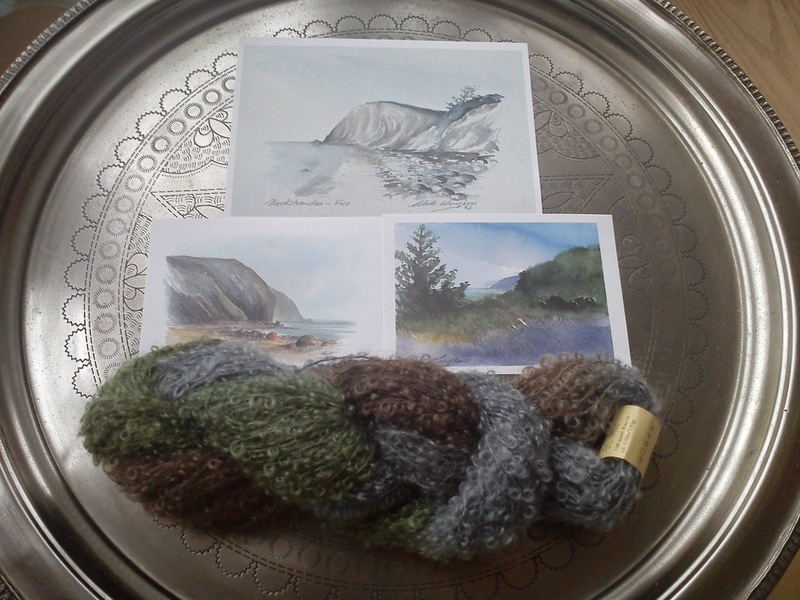 Finally as the non-eatable souvenirs from Fur I brought some wool at Fur Ø gårdbutik Klode for a light neck warmer together with three small drawings from the island. 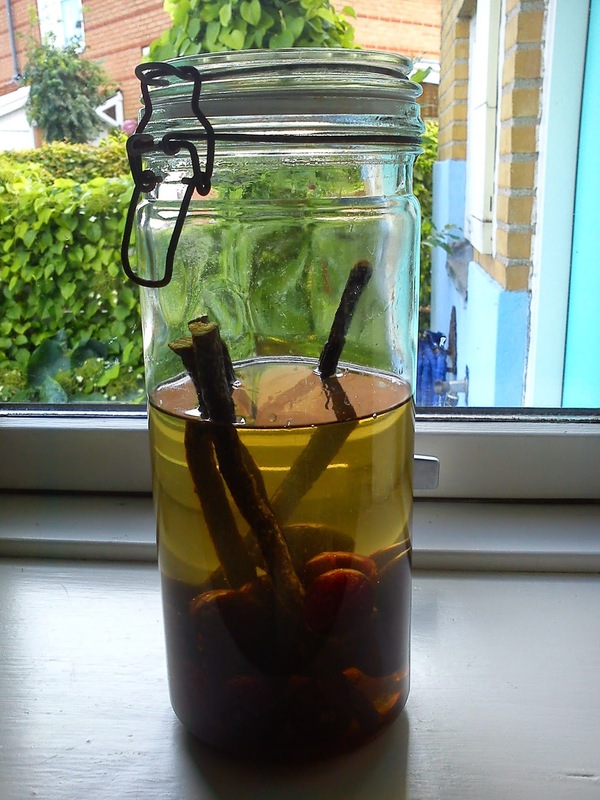 When I noticed this recipe in the magazine Isabellas CountryLiv issue 3/2014 on liqueur made on aquavita, fresh cherries and liquorice roots I knew at once, that I need to test it out in my little kitchen. 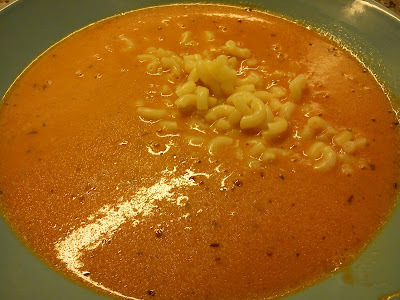 I decided to make two changes to the recipe. 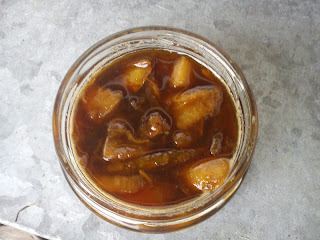 I replaced the plain sugar with brown sugar instead off, that I like the caramel/liquorice flavour from this type of sugar. And instead of making the liqueur in two portions I decided to pour all the ingredients into one big storage glass. I am really looking forward to taste this liqueur. Start by pouring boiling water into the storage glass, let the glass stand for 5 minutes, before emptying it. Cut four small cutting into each cherries. Do not remove the stone from the cherry. 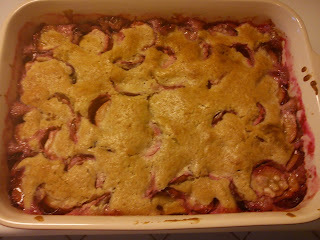 Place cherries, liquorice roots and brown sugar into the storage glass. Pour the aquavita into the glass as well. Shake the glass, before it is stored cold and dark for minimum 3-4 weeks, before you can enjoy the taste of it. I was one of the lucky 100 people, who managed to get hold of the August dinner "sale" deals arranged by restaurant Vedelsborg located in Vejle in form of 3 course dinner for 2 persons for 400 DKK excl. drinks. I have really been looking for eat here since I enjoyed take-away Vedelsborg menu for my birthday. All my expectations were fulfilled in form of great tasting food and excellent service. 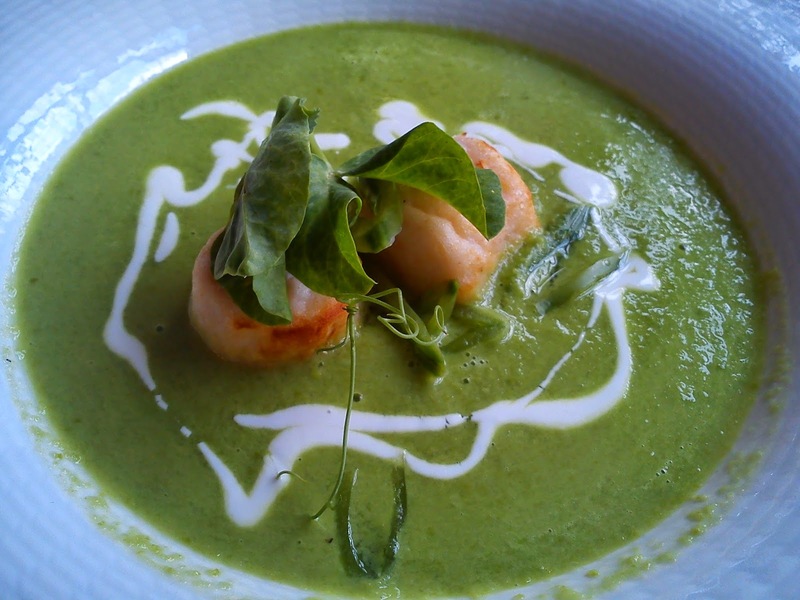 As starter we choose pea soup with pieces of Norway lobster souffle, sugar snaps, pea leafs and sour cream. Excellent taste and fantastic texture differences between the rough blended soup, soft pea leafs and cracking sugar snaps. 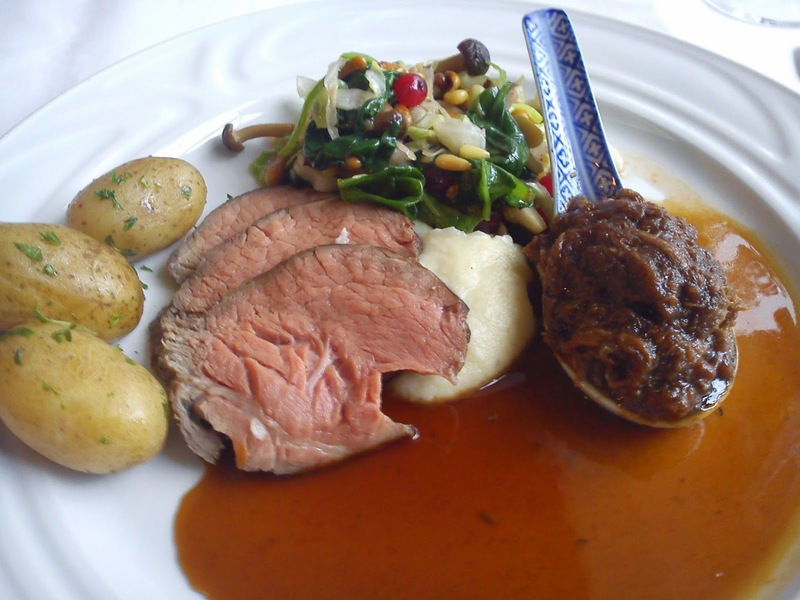 For the main course we selected fillet & rilette of beef, served with new potatoes, puree of root parsley, a warm salad of this beech mushrooms, spinach, summer cabbage and red currant and finally a ox glace. Uuummhhh, the rilette had the most rich fantastic taste. 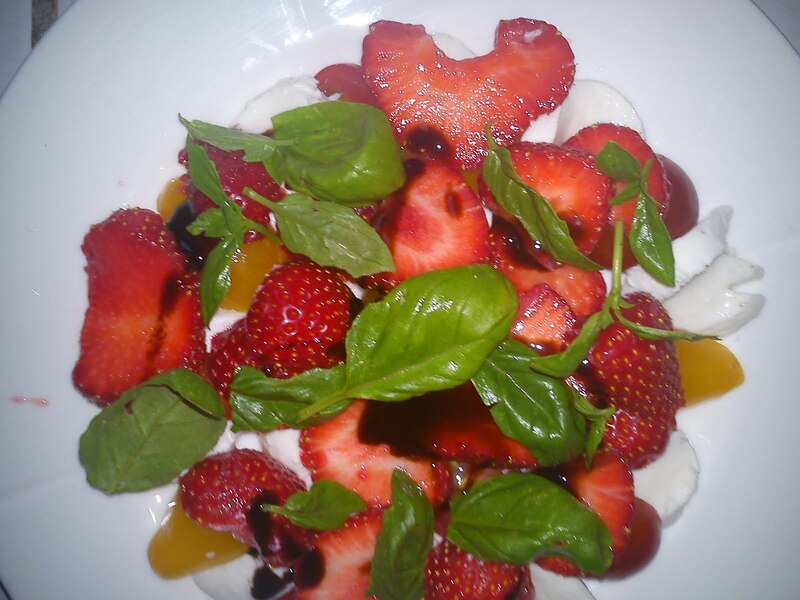 And the use of red currant in the warm salad gave a refreshing flavour note and texture to this salad. After these two course we were feeling quiet filled, but we still had one more dish to enjoy in form of dessert. 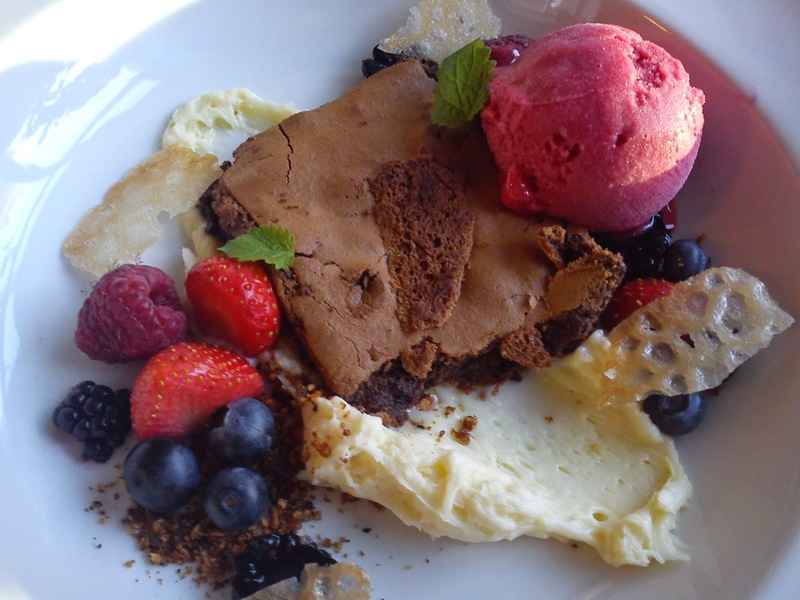 The dessert was an excellent combination of fresh tasting raspberry sorbet and the sweet part in form of airy dark chocolate cake, white chocolate cream served together with various fresh Summer berries. This three course dinner incl. one glass of white wine costed 275 DKK. 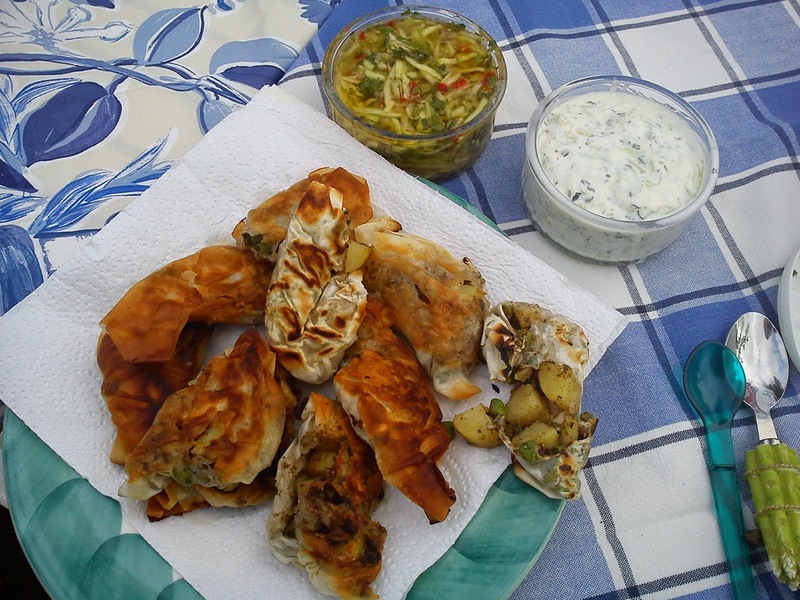 And I will give this dinner six stars for it´s great taste and all the attention to the details to both flavour and texture combination combined with excellent service. This is a place, which I only can recommend for you to try out on your own. 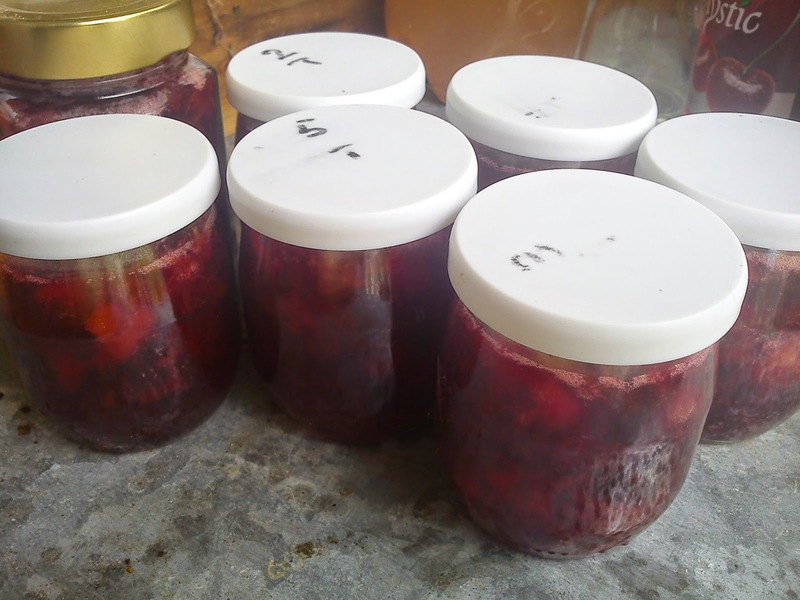 Besides from making the annual Lønnestræde Plum in spiced red wine I also made some classic plum jam without any addition of spices, as I wanted to have the pure taste of plum. 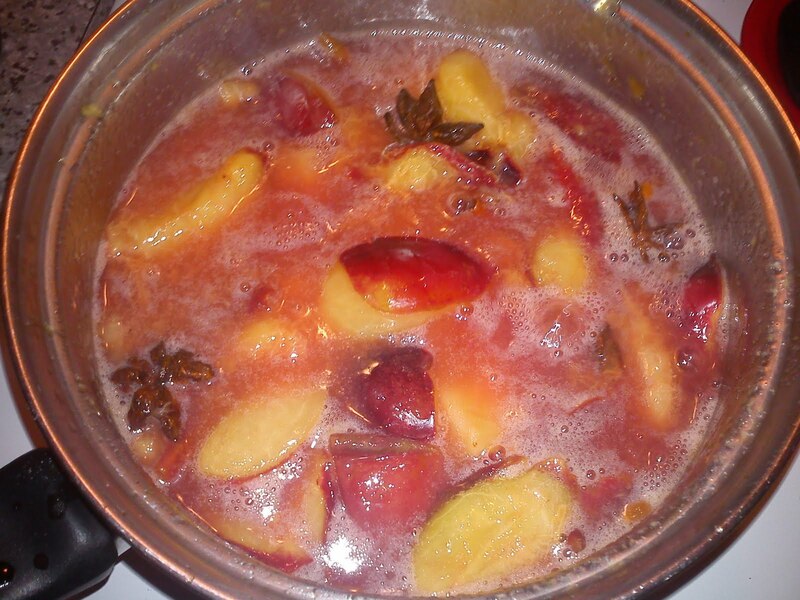 Heat up the plum pieces together with water and vinegar in a cooking pot together over low heat. Stir on a regular basis. Heat the fruit up to 80'C. 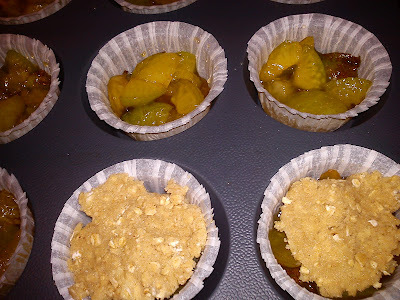 Mix the pectin/gelling powder together with 50 g sugar. 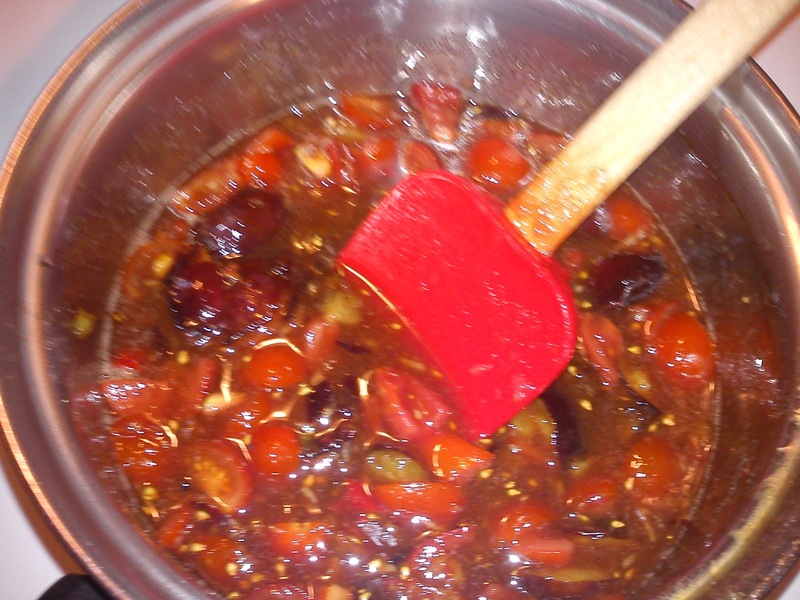 Add this dry-mix slowly to the plum, while you stir very well in the cooking pot to avoid lump formation. Let the plum cook slowly for another 5 minutes. 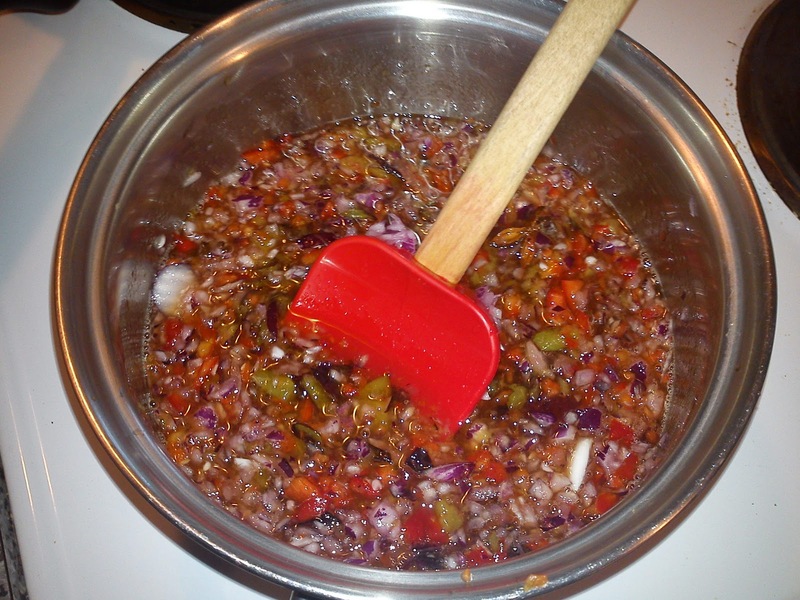 Stir on a regular basis. 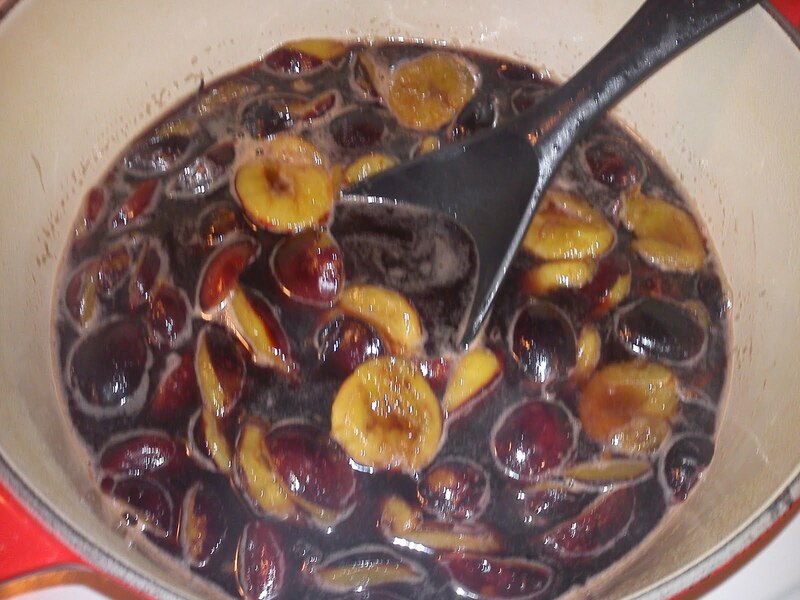 With the arrival of a new plum season here in Denmark, it is time for me again to make this years version on plum in spiced red wine. 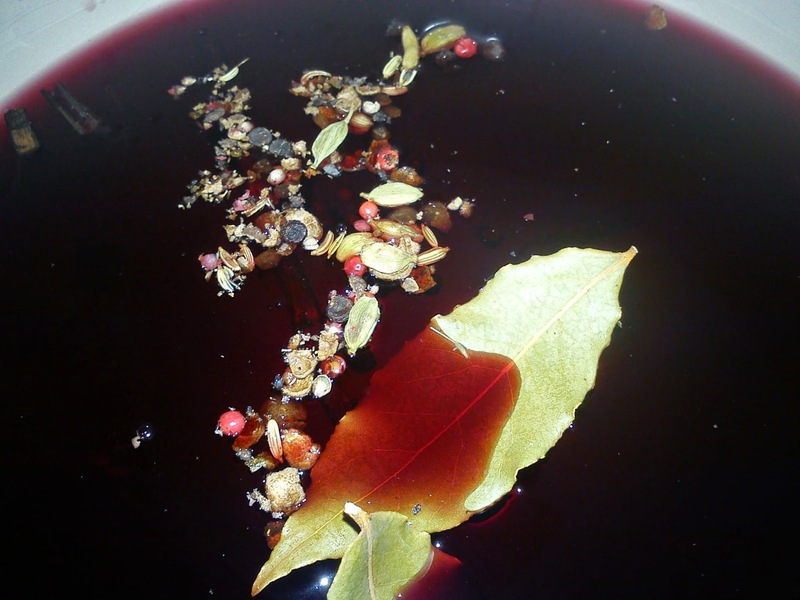 I continue to make modification on this recipe of mine on Lønnestrædes Plum in spiced red wine 2013, this year I have decided to twist the flavour in the direction of liquorice. 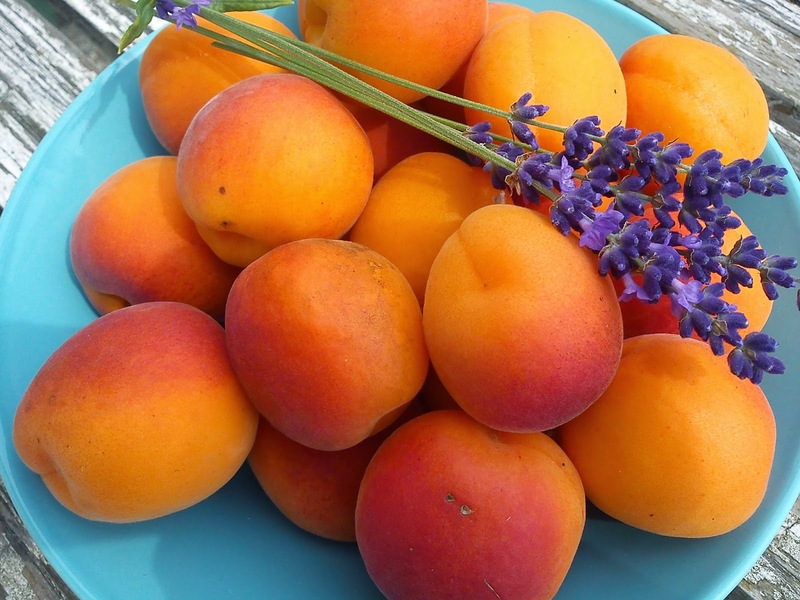 I am really looking to taste these plums sometime during Autumn/Winter in the company of some good friends. Wash the plums and remove the stone. Cut the plum into 2 pieces. Cook up the red wine with sugar and all the different spices. Add the plums into the red wine, and let the plums cook for 5 minutes. Add the plums into the storage glass. Reduce the red wine syrup into half the amount. Fill the red wine syrup into the storage glass with the plums. 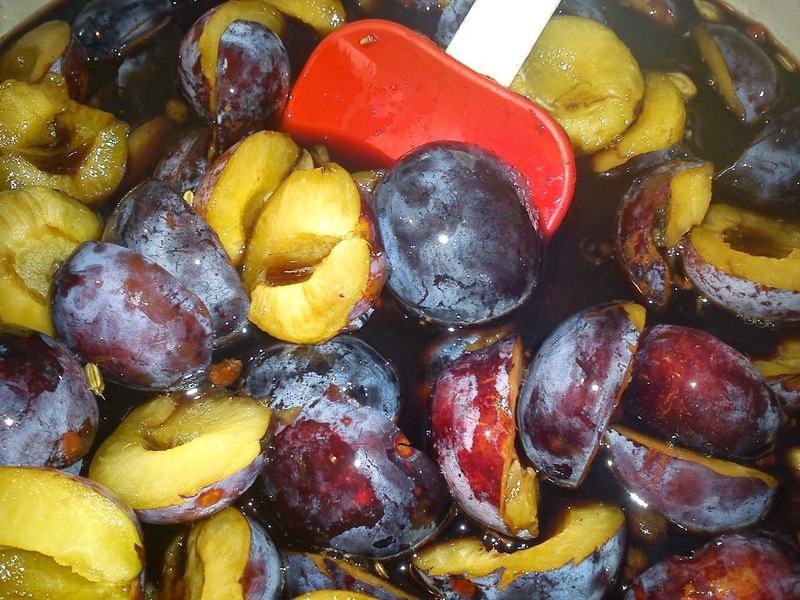 Let the plums mature for minimum 2 weeks, before using them for dessert. Serve the plums together with whipped cream or ice cream. Yes !!! 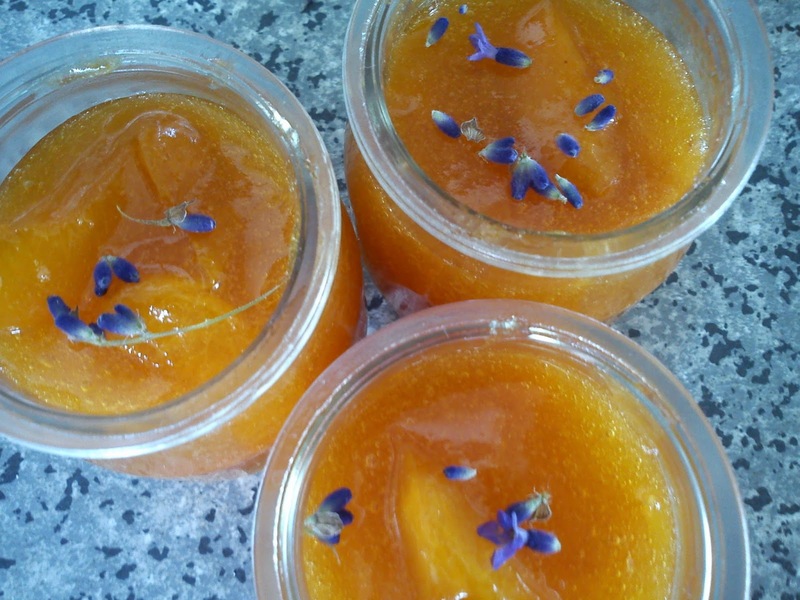 My apricot jam with lavender / abrikos marmelade med lavendel has been awarded as one of the five best home-made Danish jams of 2014 in a competition (Isabellas - laver du Danmarks lækreste syltetøj) runed by the magazine Isabellas and Dansukker. 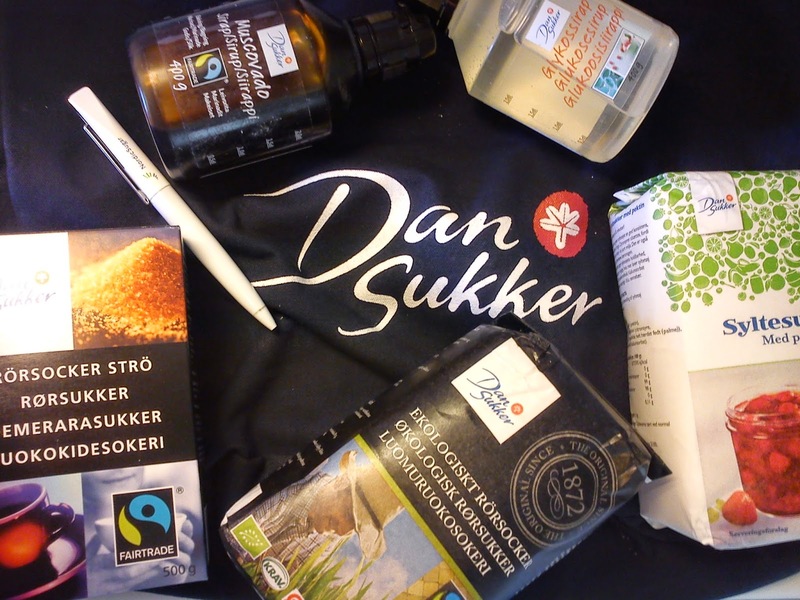 Today I have therefore received a goodie-bag from Dansukker full of various sugar products for further creations in my little kitchen. After a rowing tour with some rowing friends coming from outside Vejle, we decided to have lunch at Remouladen, as it is situated more or less next door to the rowing club in Vejle. So it was an easy place to eat in this specific situation. 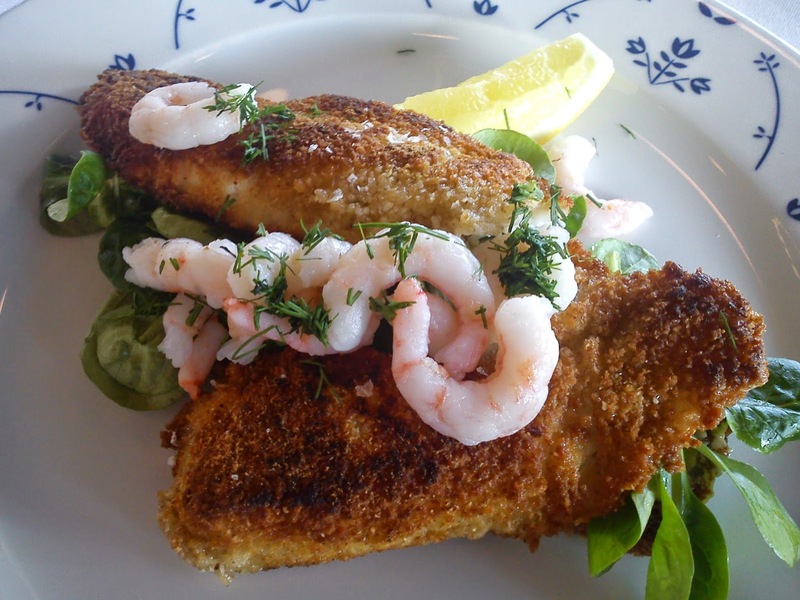 I decided to have two classic pieces of open Danish sandwiches: the first being egg with scrimps served on rye bread and the second being fried filet of plaice with remoulades as well served on rye bread. 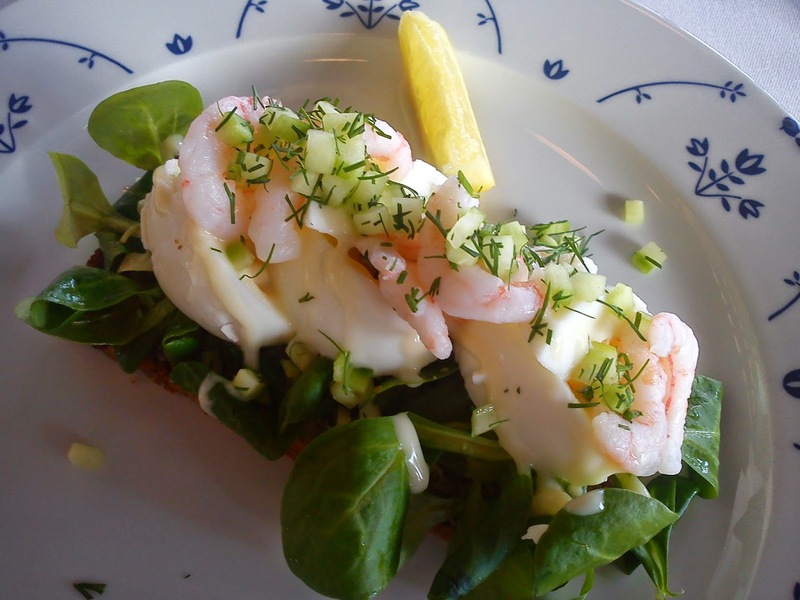 Both pieces of open sandwiches are my two favourite pieces among the many type of open Danish sandwiches. 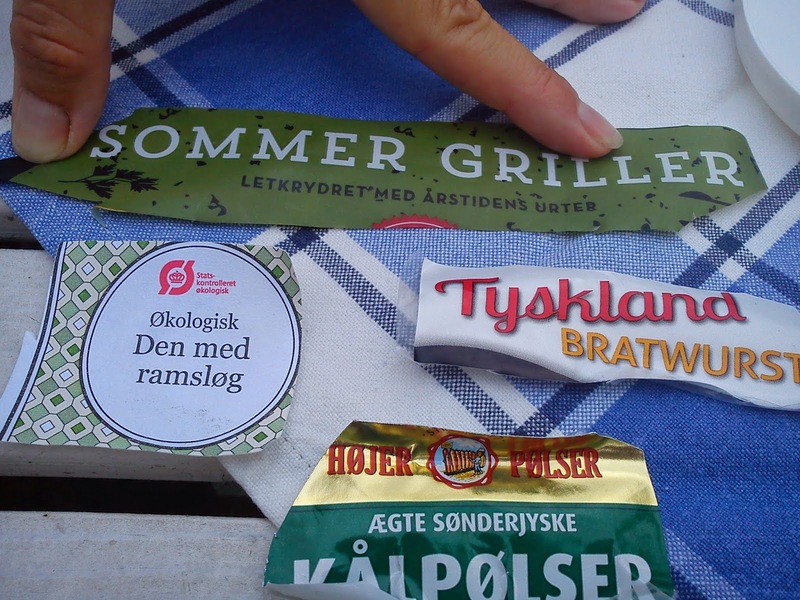 The prices for these two sandwiches was 134 DKK without any anything to drink. I think this is the price level eating lunch. The service was better this time compared to last time having dinner. However, it is not a place standing out as extra-ordinary. 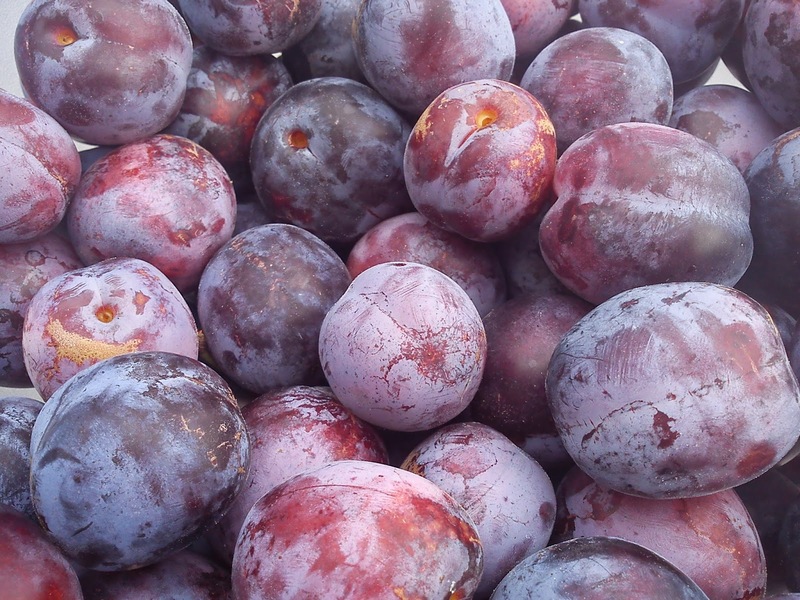 The plum season has arrived here in Denmark, meaning that you easily can get hold of plums from friends and work colleagues for free, as people with one or more plums trees during the peak period as becoming desperate to ride of their surplus of plums. And the plum season of 2014 is very rich due to warm Spring and Summer here in Denmark. The first option is off cause to make jam, this jam has an interesting spice twist to it in form of cinnamon and and star anise. You can add flowers or herbs from your garden into your tea to give it a flavour twist. 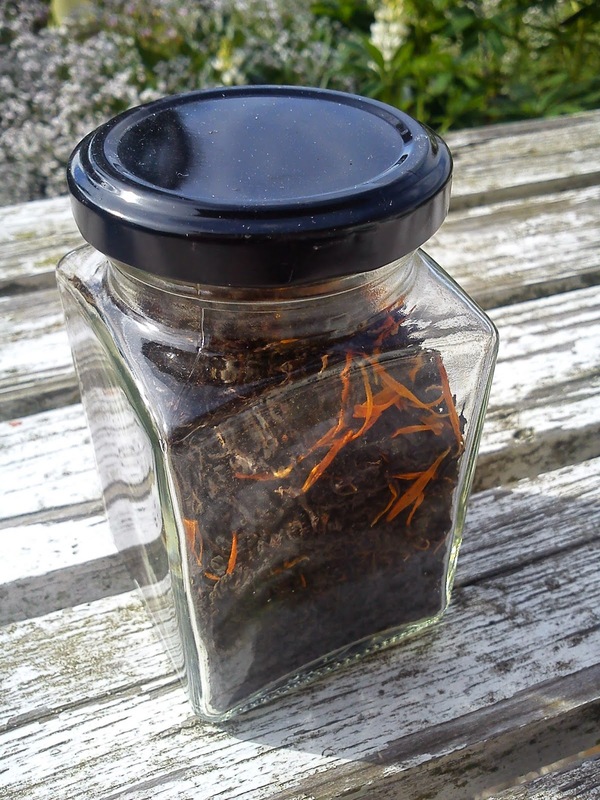 This time I did not go for a flavour modification of my tea, but for a more visual appealing tea instead of bringing the Summer inside to my tea containers. I assume it would be better to store your tea in metallic containers to prevent oxidation coming from sun light, when you use glass for storage of tea. However, when you can see inside the tea tin and see how the Summer has moved into your tea as well !!! 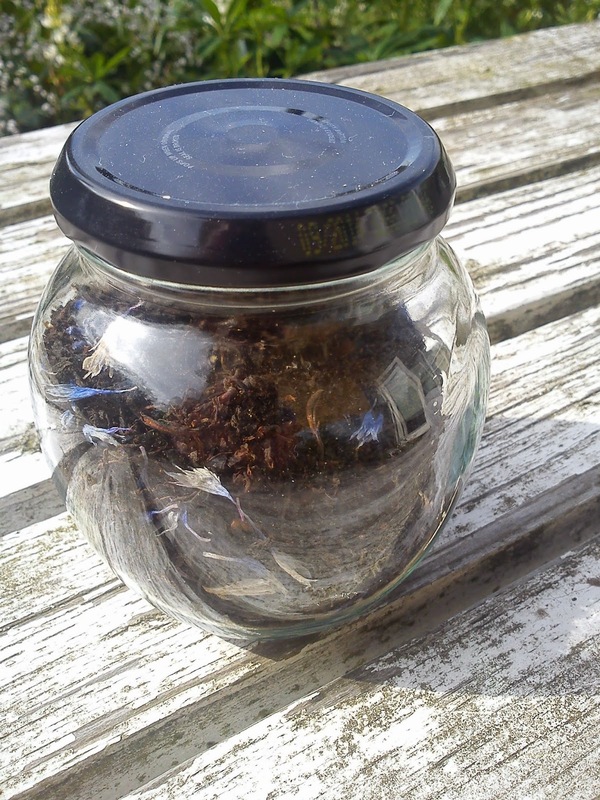 Therefore I store these type of teas in glass container, which is placed in my little kitchen window being a part of the decoration. It is important, that you use dried Summer flowers, as un-dried flower heads can make the entire mouldy and thereby undrinkable. Remove the leafs from the Summer flowers, so they are individual, and thereby can give visual impact to the tea. Mix tea leafs and flower leafs together. Where are the guests ? Saturday evening a group of great friends as usual meet in my little garden for the yearly barbecue event, where all participants bring their part of the food. I take care of the firing up the grill, the liquid part of the menu and the sweet dessert part. 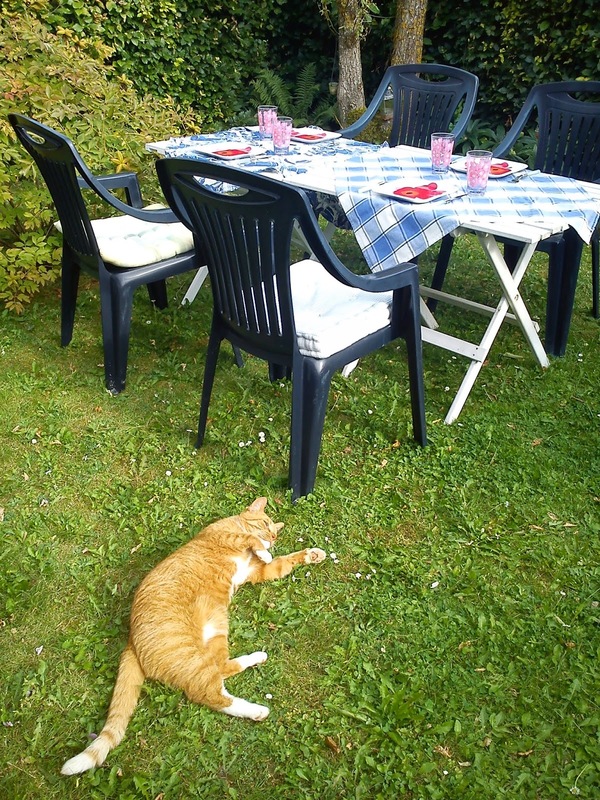 Hannibal the Cat was coming and going, not being able to locate his usual resting spot on the terrace, which was occupied by the bonfire plate. 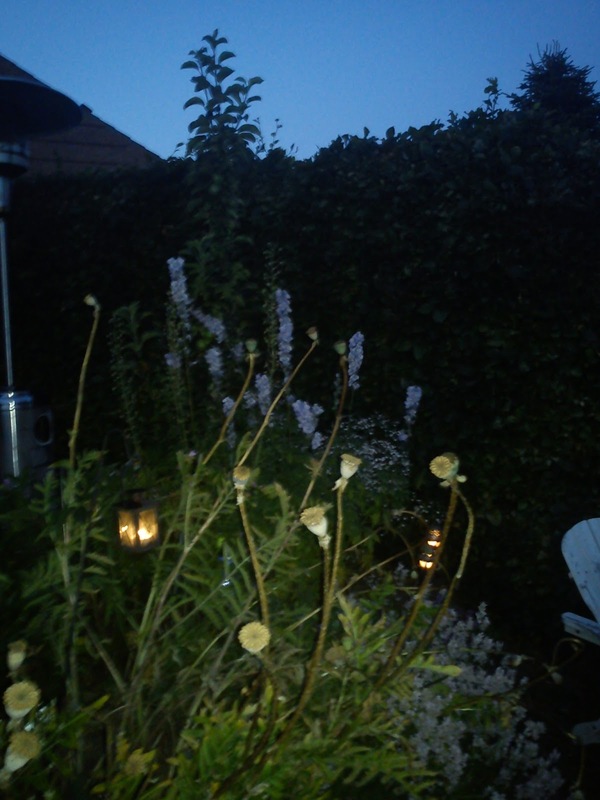 The weather was just perfect this evening, it was quiet windy, but the temperature were above 20'C during most of the evening, so we could sit outside enjoying the a perfect Danish Summer evening. 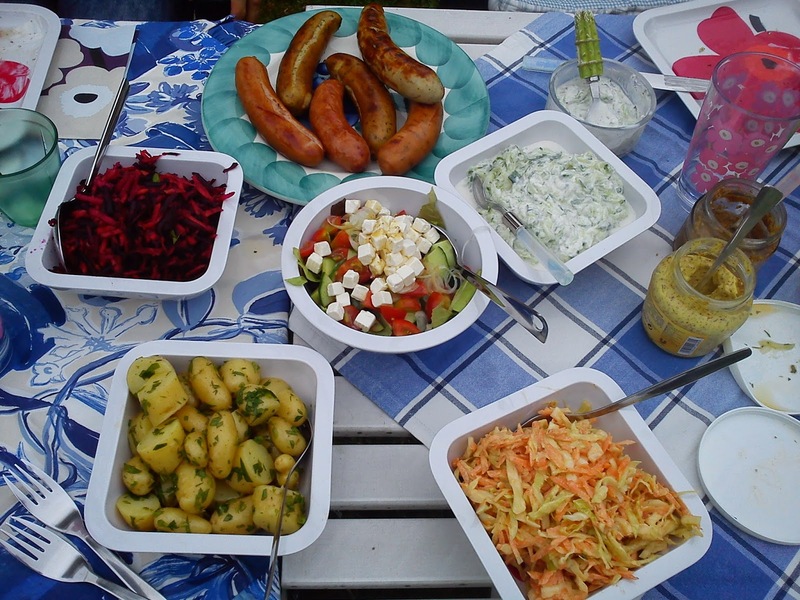 The main course was a selection of various sausages, as the guest bringing the meat part had to travel with train from Copenhagen to Vejle, so it had to be possible to transport the food under safe condition. 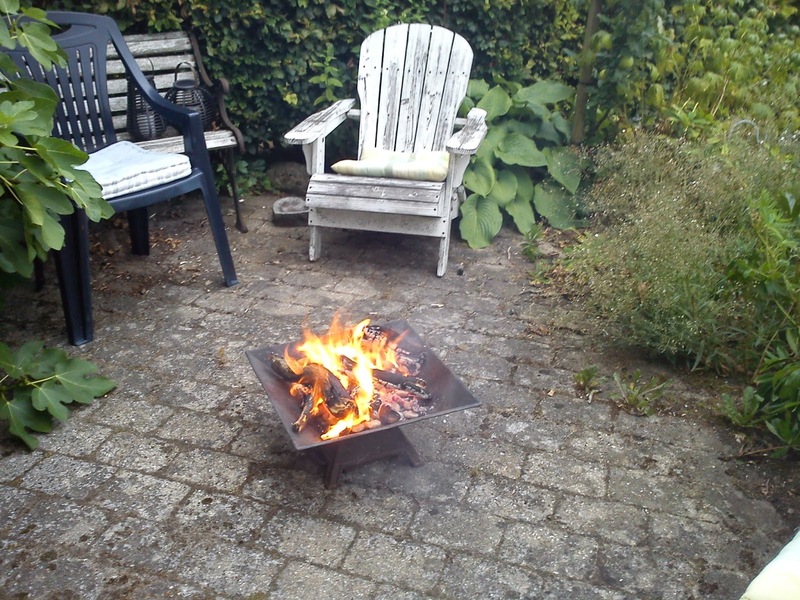 Using the remaining barbecue charcoal a fire was lit in the bonfire plate on the terasse, which played an important role for preparation of the dessert. 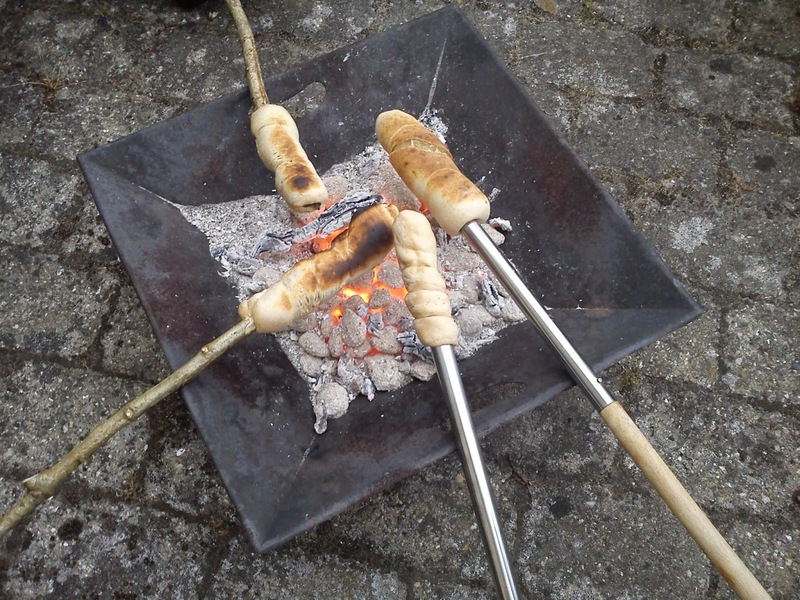 The dessert this year was twist bread (this year without marzipan) and roasted marshmallows served as filling between two Oreo-style biscuits. 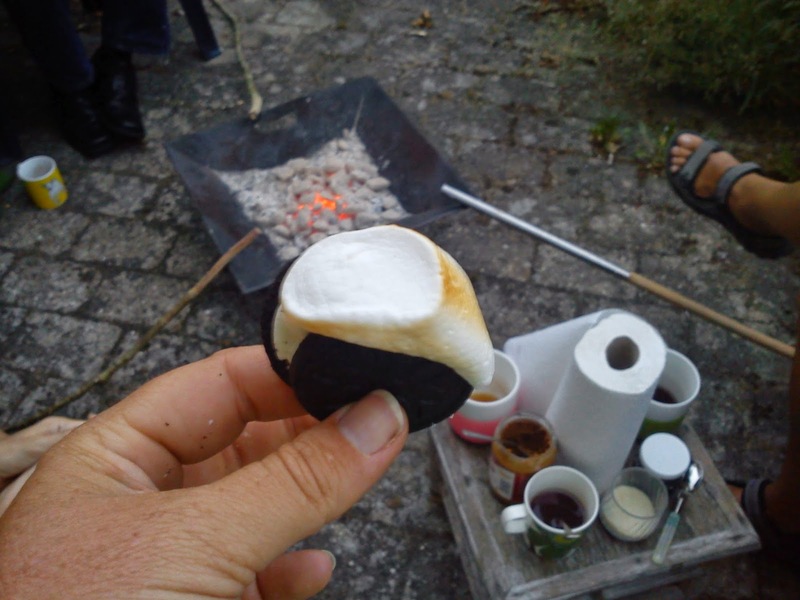 The Danish vanilla biscuit called Mariekiks would be another good serving suggestions for roasted marshmallows. 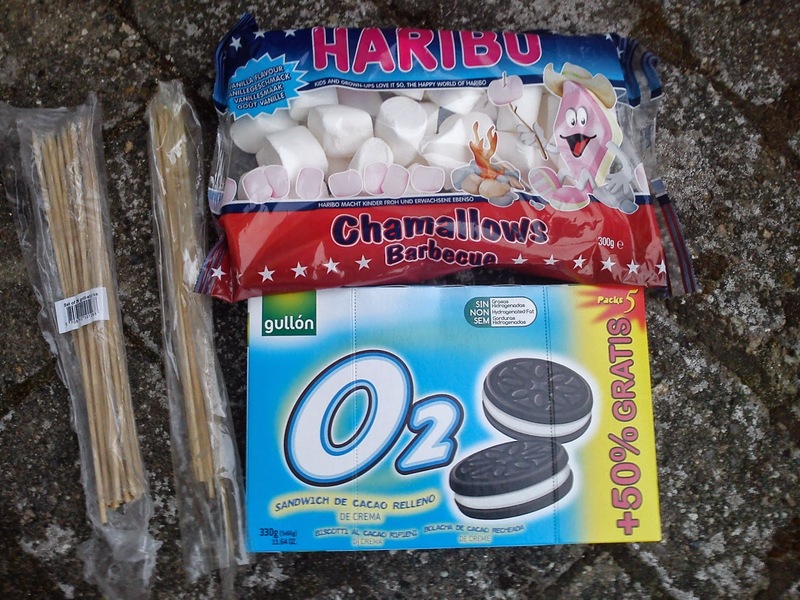 None of the guests had never tried to roast marshmallows as biscuit filling, so this turned out to be great thing to do. Ready to be eaten ! Being the last Summer month August is also a big harvest month of home-grown produce from my little kitchen garden. 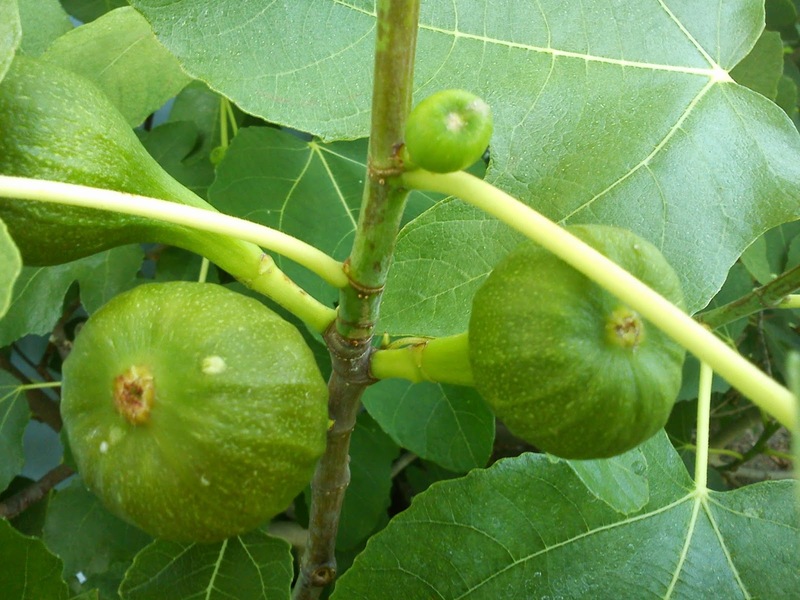 The fig tree is bearing a huge flock of figs, which I am looking very much forward to taste. Here in Denmark you are only able to enjoy the figs appearing during springtime, as the second round of figs, which start growing in July will never mature in Denmark due to our climate. 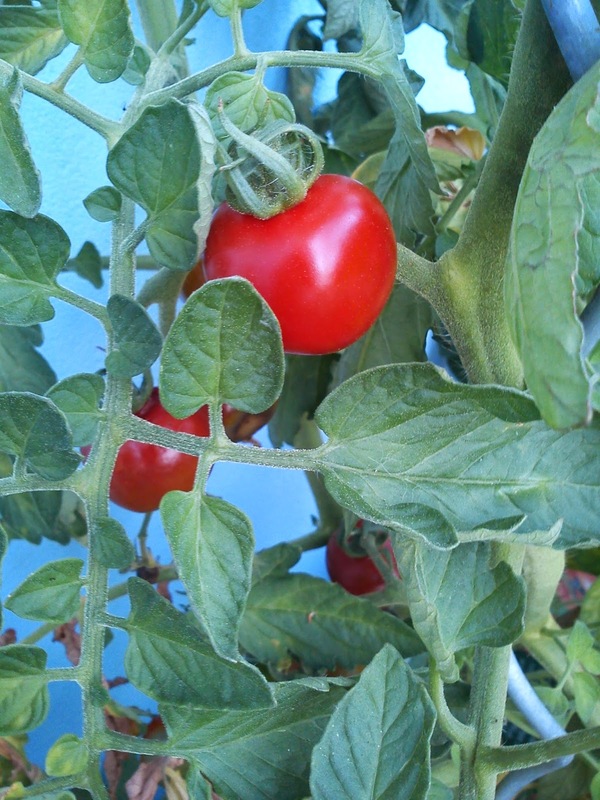 My various tomato plants are now booming with plenty of tomatoes, which sometimes can become to overwhelming to eat your way through. Let´s see how I will succeed this year.